What was the greatest day in Canadian pop culture history? You might say October 11, 1952, when Hockey Night in Canada appeared on the airwaves for the first time. Or February 28, 2010, when Michael Bublé sang The Maple Leaf Forever with giant floating beavers, flying moose, dancing Mounties and tabletop hockey players at the Vancouver Olympics closing ceremonies (I swear I am not exaggerating in the slightest) hours after Sidney Crosby’s golden goal. Or something else involving hockey, because we’re obsessively single-minded adorable like that. But you would be wrong. The greatest day in Canadian pop culture history happened 30 years ago today. 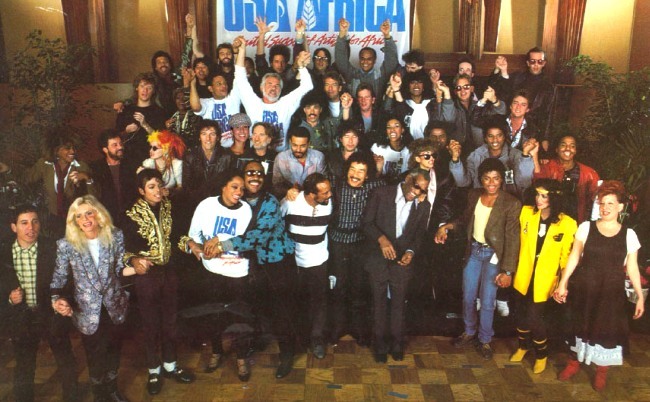 This is We Are The World, the American all-star charity single that saved Africa forever. You probably already knew this, because it’s the lens through which every “celebrities come together for a CAUSE” parody has been inspired by since. We Are The World came after its British counterpart, Do They Know It’s Christmas, and was recorded in January 1985. Producer Quincy Jones thought it would be great to have a Canadian version, phoned David Foster….and on February 10, 1985, the largest gathering of Canadian stars (insert obvious joke here) ever joined in song in a Toronto studio. The song was Tears Are Not Enough. It was everything you imagine 1980’s Canadian culture to be and more. And 30 years on, it’s threatens to become a footnote to Millennials. Which is why we need to lionize it today in a way Millennials will appreciate—with snark, nostalgic joy, and GIFs. Now, unlike most Canadian retreads of American and British ideas (DID YOU KNOW CANADA MADE A CHARITY SINGLE TOO?!? ), there was some merit to this most ultimate of Can-Con projects. Much of the world learned of the Ethiopian crisis through a CBC documentary that aired months earlier. And while the idea of rich celebrities telling people to feed poor Africans has grown, shall we say, problematic, there were nothing but good earnest Canadian intentions at the time. But today, we don’t care about any of that. We just want to gleefully praise and mock it. Joining me on this journey is James Lewis. Like me, James is a Global News producer, born and raised on the west coast, cynical beyond his years and with a love of nostalgia. HOWEVER, James is in his early-to-mid 20s, while I’m in my mid-to-late 20s. Diversity. Enough chit-chat. Time to examine this most Canadian of songs. 0:43—For millennials, the first “who are you?” moment of the video. According to the internet, his name is Dan Hill – and he actually achieved modest success in his time. So there you go. But considering the ensemble, it’s puzzling why he would get such high billing. I know neither of us were alive when Loverboy was relevant, but it was deeply, depressingly relevant for a number of years. I’m just disappointed Reno beat out Trooper’s Ra McGuire for the sole “bombastic arena rock” slot. Also, have you ever wanted to hear the frontman of Trooper singing “Time Goes By” in the most bizarre 1980’s TV show ever? Because here’s you’re chance. 1:17—Our first group shot of the affair. A couple things: Anne Murray appears to be dressed for a child’s birthday party – and is oddly captivated by her headphones. Foster has eliminated all dissenters by this point. Also, we’re ignoring the greatest example of Foster’s egotism in the official music video, which is when he uses THE 1985 NHL ALL-STARS, LED BY WAYNE GRETZKY, AND HUNDREDS OF FANS SWAYING AS PROPS FOR HIS GRINNING MUG. JM: Well, I am exhausted. And my first-generation Chinese-Canadian landlords upstairs are thoroughly confused as to why I’ve played this song 40 times in a row. Any last thoughts James? JL: It’s significant to point out neither of us were actually alive when “Tears Are Not Enough” was initially released. I say *initially* – because there’s only one proper way to adequately honour its 30th anniversary… and that’s a re-release. Look at its counterparts from the days of “charity single mania” in 1984-85. The moment the chants of “feed the world” start to fade, you just know Bob Geldof is already planning an updated version of “Do They Know It’s Christmas.” Seriously, it was re-recorded in 1989, 2002 and 2014. Quincy Jones managed to get the band back together to mark 25 years of “We Are the World” in 2010. As for Canada? It’s a challenge just finding a watchable version on YouTube. The song isn’t even available on iTunes. Truly mind-boggling for one of the biggest-selling Canadian singles of the 80s. So let us appeal directly to David Foster and Bruce Allen “If we can pull together – we could change the world forever.” Let’s see the “Northern Lights” shine again. JM: Bruce Allen, who put together the original supergroup, manages Michael Bublé. Justin Bieber needs the good publicity. Sarah McLachlan is always around. But on the other hand, can you really duplicate perfection? It might be that Canada will only ever produce one all-star charity single of this magnitude. But what a single it was.